Looking to keep the temperatures down in your engine bay, but also free up some extra power gains? Exhaust wrapping is simple, easy and great value for money. This is the ultimate heat wrap guide. In the past, exhaust heat wrap was only really seen on performance cars. Over time, more and more owners witnessed the benefits which heat wrapping provides, and it has now become one of the most useful cheap and convenient DIY modifications. Whether you’ve got some shiny new engine bay bling or you’re looking to keep the temperatures down on your existing setup, heat wrapping can give your tuned car a great look whilst also providing performance gains from the increased engine efficiency. Either way, you’re going to want to protect your valuable upgrades or stock parts to ensure that they last the test of time whilst providing you with numerous other benefits. 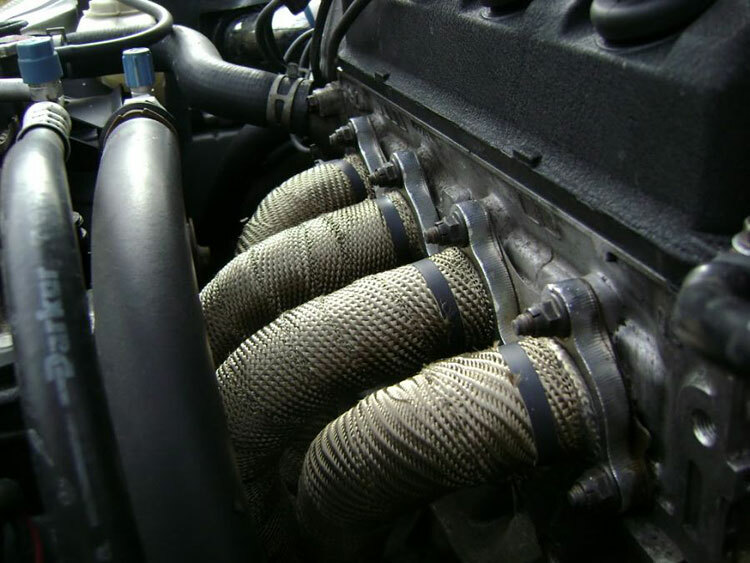 What are the benefits of exhaust wrap? How can simply wrapping your headers provide you with additional horsepower? Exhaust wrapping will ensure that the heat remains within the headers rather than dissipating to other areas of the engine. Some of the wraps in our guide are rated to drop the engine bay temperatures by up to 50%. When heat is contained within the exhaust headers, for example, it then improves the flow of gases throughout the entire system. This will make the exhaust gases move faster, therefore providing your engine with more power. With your engine bay temperatures down, less warm air will be entering the intake which in turn will also provide additional cooling. At the same time, the heat wrap will ensure that your specific exhaust components are maintained at a higher temperature to provide maximum efficiency to reduce drastic temperature changes. We always aim for maximum airflow when tuning, whether it’s providing cold air for the intake, fitting superior headers, or ensuring that the free-flowing exhaust has as few restrictions as possible. 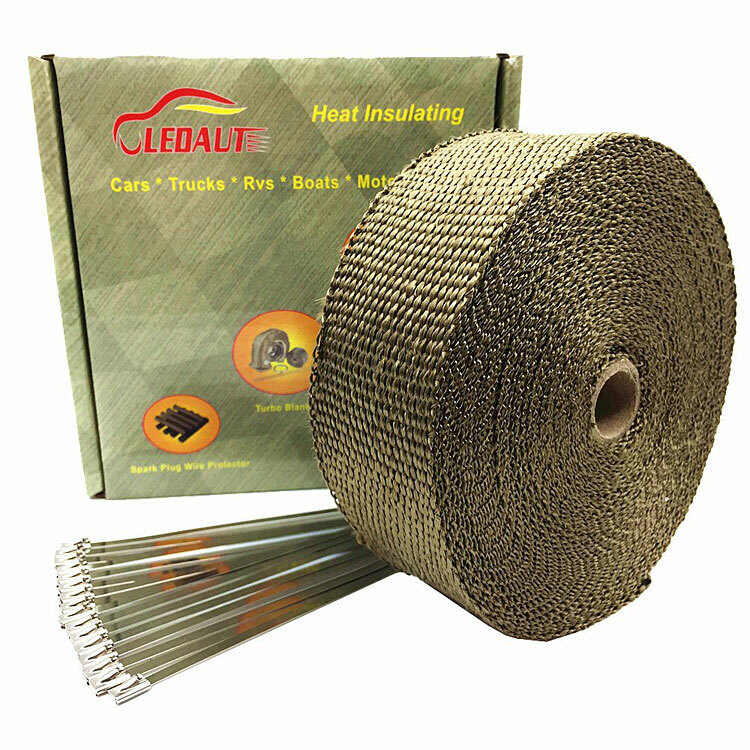 Exhaust heat wrap is simple to fit and can be done yourself with just a basic how-to guide and simple tools, which you’ll undoubtedly have laying around. Although applying heat wrap isn’t the challenging job, you’ll want to make sure you get it right, and DEi have provided you with the perfect how-to video to ensure you get the most out of your heat wraps performance. As a bare minimum, you’re going to want to purchase a set of stainless steel locking ties, which are designed to keep the wrap securely in place and also complete the fresh new look. These will often come as part of a kit, so keep your eye out for them in our guide. How much exhaust wrap will I need? If you’re not sure how much heat wrap you’re going to need, you can enter your measurements into this useful heat wrap calculator, which will tell you the exact amount you require. It’s always convenient to get a little more than you need for those ‘just in case’ moments! We highly recommend doing this with the parts you wish to wrap either taken off the car or prior to initial fitting. Sure, some owners have fitted heat wrap with a header still fitted, but to ensure you do the best job possible, it’s worth taking it off and doing it properly. Now that you’ve gained some heat wrap knowledge, it’s time to compare the best products on the market to release the valuable horses just waiting to be freed under the hood with the minimal expense! To read more about any of these products, simply click on the heat wrap name, or photo. 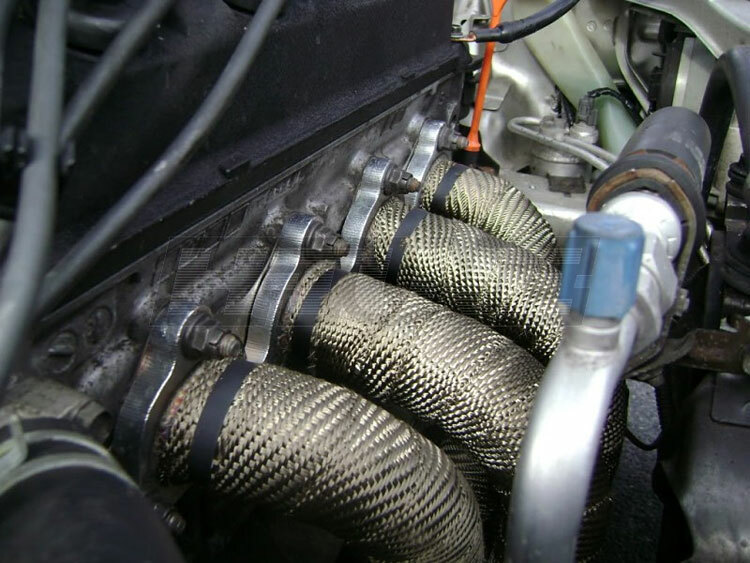 Our comment: ISR Performance are well known in the aftermarket tuning scene, and their Titanium exhaust wrap is undoubtedly one of the best choices available on the market. Made to withstand 1800˚F direct, or 2500˚F intermittent heat, this is certainly going to be more than capable of cooling a high-performance car. 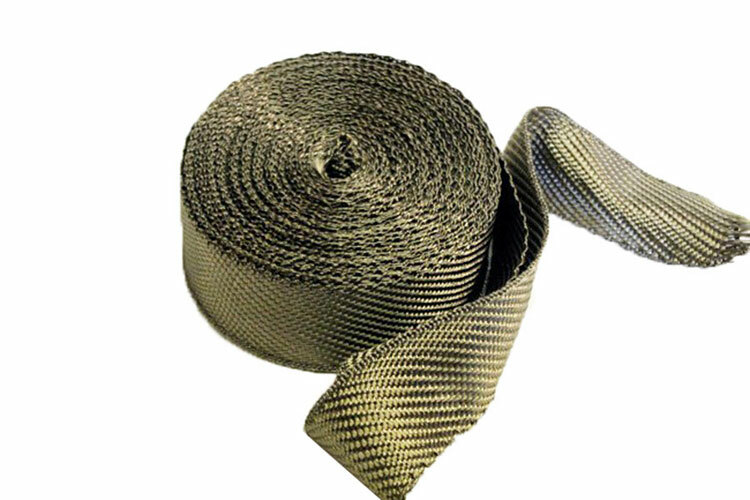 Exhaust wrap can sometimes be on the tougher side with minimal flexibility, but ISR have addressed this issue by making it pliable, which enables a tight and secure wrap. Thankfully, they’ve provided 50 feet of wrap with this kit, so it should be more than enough for most needs. ISR Performance state that pre-wetting before applying their wrap isn’t necessary, however, we’d recommend wearing gloves as a precaution, especially on dry wrap as it can get very itchy! You’re going to struggle to find a better contender performance-wise, however, you’ll also need to purchase the stainless steel locking ties separately for a complete kit. Our comment: Another excellent choice comes from another well-known tuning company, Mishimoto. They’ve gone for a slightly different approach by supplying their stainless steel locking ties as part of the kit, however, it is 15 feet shorter than the ISR Performance choice above. This should still be enough for tightly wrapping a 4-cylinder engine, but you’re probably going to need a looser wrap if you’re looking to apply it to a V8. Like the ISR Performance option, this is capable of handling direct temperatures up to 1800˚F and capable of radiant temperatures up to an impressive 2800˚F! We personally feel that even at the higher initial price without locking ties, the ISR Performance option is better value for money due to getting an additional 15 feet of wrap, but as far as quality goes, the Mishimoto certainly won’t disappoint if you only require 35′. 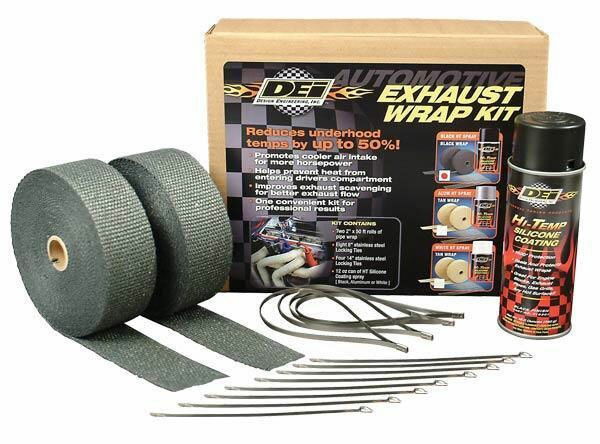 Our comment: DEi are one of the highest regarded companies in the heat-wrapping game, and this complete kit includes everything you could need for a long-lasting heat-wrap setup. 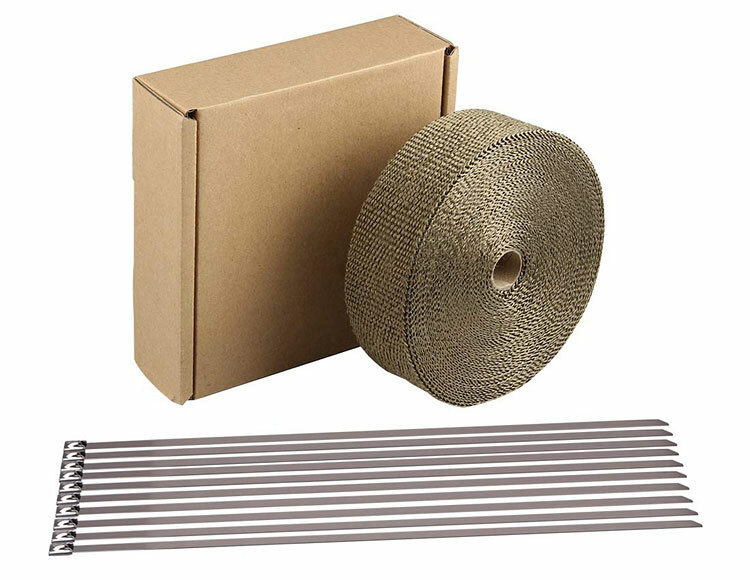 Not only do you get two rolls of 50′ wrap, but the kit also includes the stainless steel locking ties AND a can of silicone coating for additional protection. This will be more than enough to easily cover a V8 and you’ll most probably still have some wrap left over too. The included silicone spray seals the heat wrap material and provides lasting protection from oil, dirt and road grime. You can coat anything you like in this, and it’ll provide heat protection up to 1500˚F on its own. It’ll also stop your heat wrap from drying out, enabling it to last much longer. The wrap itself is capable of 1200˚F direct heat and 2000˚F radiant, but combined with the spray it’ll undoubtedly be capable of far more. This is an excellent off-the-shelf kit which will be ideal for most applications, and even comes in three color variations! That’s because the Titanium heat wrap is equipped with LR technology, which has been made from pulverized lava rock and stranded into a fiber material before being woven into a proprietary weave. Titanium wraps are engineered to be stronger than other wraps on the market and also more durable, providing improved thermal performance and reliability. This is one of the best when it comes to withstanding heat, too. With 1800˚F direct heat and 2500˚F radiant, it’s undoubtedly going to be perfect for your needs. As with other titanium wraps, pre-wetting the roll is not required, and once fitted it’ll provide you with a fantastic carbon fibre-esque look. If you’re after the best standalone heat wrap, with no messing around with sprays, then this is probably the best bang-for-your-buck product out there and comes in a wide range of sizes. Just don’t forget to purchase the stainless steel locking ties! Our comment: This is the same wrap which is featured in the DEi kit above, but the kit saves the inconvenience of having to purchase the stainless steel locking ties and silicone coating spray (to provide additional protection) separately. Given that you get two rolls with the kit, it ends up being an excellent deal for those of you that will utilize 100′ of wrap, especially once you’ve purchased the stainless steel locking ties, you essentially end up getting the silicone spray for free. With a wide variety of sizes, this could also be an ideal purchase if you require a little more than what came with the kit. If the silicone spray doesn’t appeal to you, then the superior Titanium kit above is a better option, and for the sake of a few bucks more, that would be our personal choice. Our comment: There’s no doubt that Amazon gets some fantastically reasonably priced products in their stores, and this ARTR wrap is no exception. Although they are one of the lesser known brands, the feedback on this product speaks for itself. This is made of crushed lava rock, just like some of the more expensive alternatives, but it comes at just a fraction of the price AND with free stainless locking ties for those of you on a budget. 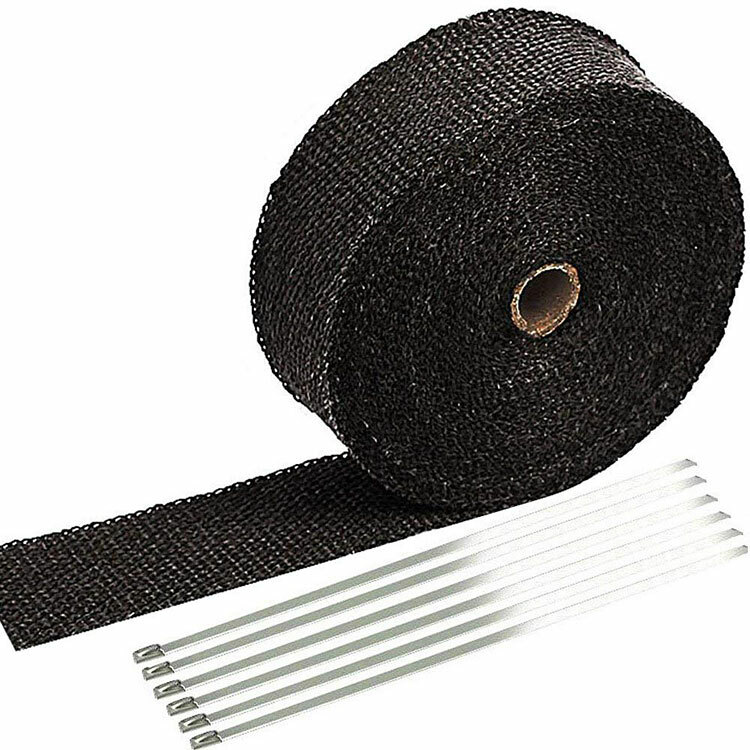 With two 50′ rolls costing just $26.99 and capable of withstanding 1800˚F direct and 2500˚F radiant heat, these exhaust wraps are undoubtedly incredible value for money. Given that taking the headers off on some cars can be a rather mammoth task, we personally prefer to opt for the more well-known brands as a precaution. However, if you’re carrying out a budget build and can easily remove your wrapped parts, go ahead! Let us know how you get on! Our comment: Another budget contender enters the market with a traditional fiberglass wrap. A lot of owners have had a lot of success with this wrap, however, it’s not quite up to the same ability as the ARTR offering above, and with just $2 difference in price, there’s no real question of what we’d go for. Capable of withstanding 1400˚F direct and 2000˚F radiant heat, this may well still appeal to you, and also includes the stainless steel locking ties. Our comment: LEDAUT bring us another bargain-priced, popular Titanium choice, which appears to be very similar to the ARTR kit at a slightly higher price. This is once again made from the superior quality volcanic rock and should certainly serve you well. However, it does reflect our feelings on the ARTR kit, and we’d personally fork out a little extra cash on a well-known brand as a precaution. LEDAUT do, however, offer a wider variety of sizes than the ARTR kit should you want a different variation. 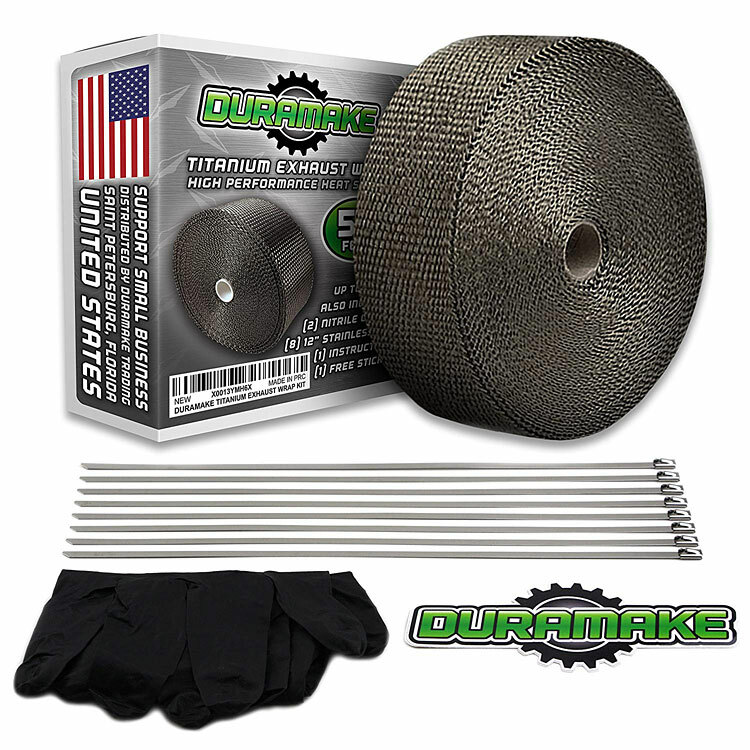 Our comment: Duramake bring another reasonably priced Titanium crushed lava rock offering to the market, however, this wrap can withstand higher temperatures than any of the other offerings within our guide, at an incredible 1900˚F direct and 2550˚F radiant heat. It may be slightly more expensive for a budget brand, but it’s still substantially cheaper than the well-known brands. Not only do they throw in a set of stainless steel ties, they also provide gloves to help with the dreaded wrap itch, and also a free sticker. Duramake have thought outside the box to bring you a slightly different alternative from the masses, with a huge amount of happy owners out there, it looks as though this will be a great option for those of you on a budget. Our comment: HM&FC once again offer some slightly different variations, with one being a double thickness titanium wrap, and another being their ‘Version Two’, which comes with a brighter and silkier surface for those of you that are keen for some additional engine bay bling! There’s no doubt that they have a competitive price point and some unique ideas, but we can’t help but feel the money would be better spent elsewhere on the premium alternatives. We’re not quite sure if the double thickness is necessary based on our DEi Titanium experiences. Still, another bargain option with some different variations which could well tick the correct boxes for your needs! 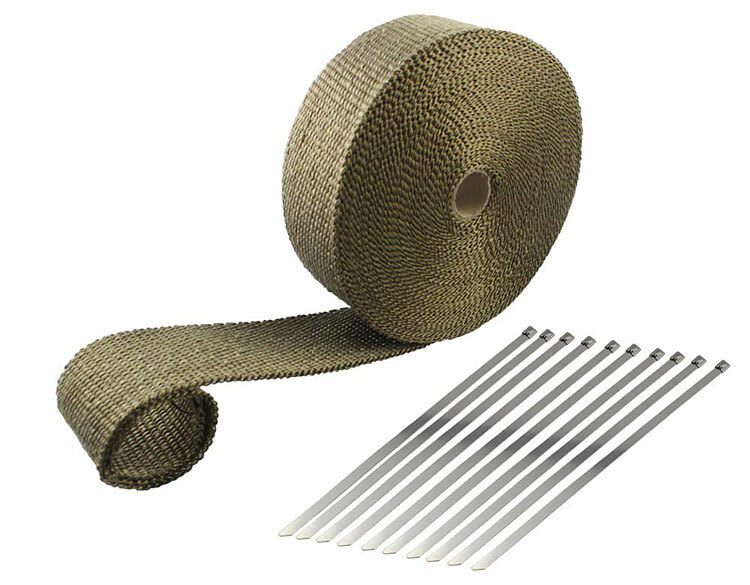 Our winner is the DEi Titanium Thermal Exhaust Wrap. 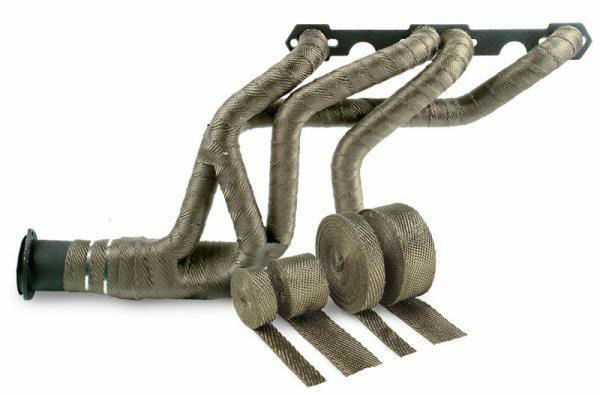 To pick our winner from this selection of exhaust heat wraps, we looked at a number of criteria; price, reliability, value for money, and reputation. Based on these criteria we have chosen the DEi Titanium Thermal Exhaust Wrap to be our winner. DEi have an impeccable reputation in this market, and their premium offering ticks all the right boxes at a reasonable price. With the headers on some cars being so difficult to remove, for the money it really isn’t a job worth saving a few bucks on for the sake of what is potentially an entire day of work removing the header! We have no doubt that the DEi Titanium Exhaust Wrap will be perfect for your needs, but we’ve researched the best variations on the market to try and find something which ticks the right boxes for everyone. For that reason, we highly recommend checking out the ARTR Titanium Lava Fiber Heat Wrap Kit. At just $14.99 for a 2″ x 50′ roll, this could well be the perfect choice if you have an easy to remove header and don’t mind taking a little bit of a gamble in a lesser-known company. 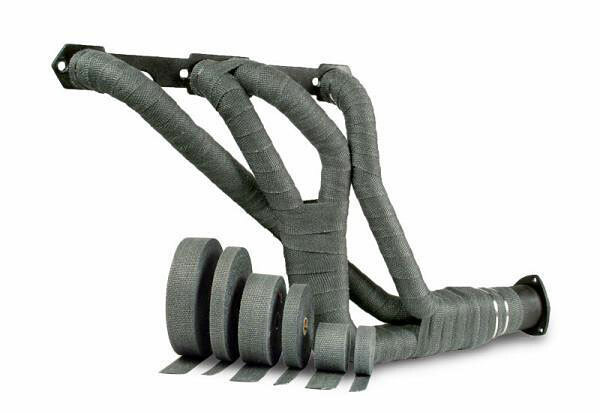 The ISR Performance Titanium Exhaust Heat Wrap is another product which will undoubtedly serve you well, and with its impressive 1800˚F direct and 2500˚F intermittent heat capabilities, it may well be what is required for your high-temperature turbo build. We hope that you’re now confident in choosing the right product to give your engine bay a facelift whilst also squeezing out some extra power and keeping the temperatures down in your bay! Looking for an exhaust or headers for your car? Check out our Drifted Tuning Guides to see if we’ve already covered your motor. If not, let us know what you’re after and we’ll do our best to provide you with the goods as soon as possible!